Garden City administrative offices are located at 301 North 8th Street, Garden City, KS 67846; phone: 620-276-1160. Photo: Cedar Cliff, ca. 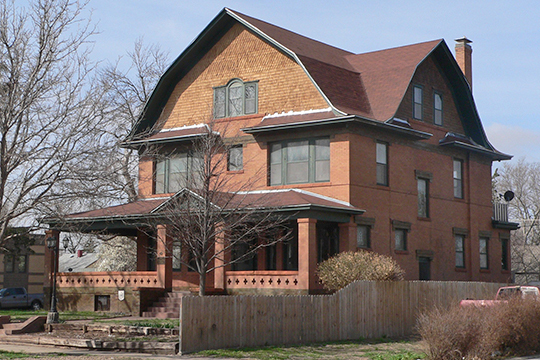 1909, 501 North 9th Street, Garden City, KS. Listed on the National Register of Historic Places in 1997. Photographed by User:Ammodramus (own work), 2015, [cc-by-1.0 (creativecommons.org/publicdomain/zero/1.0/deed.en)], via Wikimedia Commons, accessed November, 2016. Garden City, seat of Finney County, lies on the Arkansas River in an extensive irrigated belt producing sugar beets as the chief crop. The metropolis of western Kansas, Garden City is green and shining except when "black blizzards" from the High Plains sweep across the valley to bury everything under a thick blanket of dust. A majority of farmers in the region have adopted such measures as strip listing and planting of cover crops to combat wind erosion. Garden City was founded by several brothers named Fulton in 1878, to the intense indignation and disgust of all cattlemen in the region. In June 1879, the first and last rain of the year fell. "It started the grass," wrote a local historian, "but the crops perished, and many discouraged people moved away." The cattlemen enjoyed a temporary triumph, pointing out that the occasional rains were just sufficient to make the grass grow and that during succeeding dry spells it was "cured on the stalk" and made excellent hay. But farmers persisted in plowing up the buffalo grass. In the late 1880's, there was wild speculation in land throughout the Southwest, and the town boomed, achieving a population of 6,000. In spite of the warnings of cattlemen, farmers took up lands all the way to the Colorado Line, plowed under the sod, and planted corn. In 1886 they obtained a great crop, "the first and also the last corn crop ever raised in this region," according to a local historian. A period of drought followed and many farmers left the area. During the World War a new tide of settlers flowed in to raise wheat, then in such great demand, on large mechanized farms. Upon the collapse of farm prices after the war the production of wheat declined in the region, which turned increasingly to the growing of sugar beets in irrigated fields along the Arkansas. In the vicinity of Garden City some 28,000 acres are irrigated with water pumped from an apparently inexhaustible subterranean supply lying from 11 to 40 feet under the surface. Some wells supply water at the rate of 8,000 gallons a minute. This water, according to geologists of the State Water Resources Board, fell in the Rocky Mountains 2,000 years ago and seeped underground until it was impounded here. The irrigated fields about the city have an annual yield of 800,000 tons of beets, which the local factory converts into 22,000,000 pounds of sugar. During the refining season the plant provides 350 men with full-time employment. More than 1,000 hands are employed in the field during the growing season, when beets have to be hoed and weeded on hands and knees with a small hooked knife known as a beet hook. Beet tops are stored in silos and used as feed for livestock. Less than a decade after the town had been founded, residents voted bonds for the purpose of planting the now substantial trees that shade both business and residential districts. When plans were made to stretch telephone wires along Main Street in 1900, residents objected so strenuously to having their trees mutilated by the erection of poles and wires that the telephone line had to run down the middle of the street.